Last December a Virginia federal jury ruled that Internet provider Cox Communications was responsible for the copyright infringements of its subscribers. The ISP was found guilty of willful contributory copyright infringement and ordered to pay music publisher BMG Rights Management $25 million in damages. The verdict was a massive victory for the music licensing company and nothing short of a disaster for Cox. Hoping to escape the jury verdict, the Internet provider renewed its motion for judgment as a matter of law. Alternatively, the ISP asked the court to grant a new trial. For its part, BMG asked the court to issue a permanent injunction against Cox, requiring the Internet provider to terminate the accounts of pirating subscribers and monitor and prevent future infringements. After a review, the court ruled on the matter this week. In his opinion Judge Liam O’Grady affirms the $25 million judgment against Cox, while denying the motions for judgment as a matter of law or a new trial. In the verdict, the court upholds the conclusions of the jury. Among other things, it rules that there is sufficient evidence for a jury to conclude that Cox is responsible for the infringements that occurred on its network. The fact that the ISP chose not to forward BMG’s notices and settlement requests to its customers to protect them from extortion-like practices, doesn’t change this. “Whether or not Cox’s effort to protect its customers from Rightscorp was noble or well-intentioned, Cox could not also turn a blind eye to specific infringement occurring on its network,” Judge O’Grady writes. The court acknowledges that his decision will have widespread consequences for other ISPs and Internet services, and hints that further litigation could help to clarify what’s allowed and what not. “In reaching this conclusion, the Court acknowledges that the application of traditional contributory infringement to large intermediaries like Cox magnifies the uncertainties in this area of the law and raises the specter of undesirable consequences that may follow. “This case may provide the vehicle for consideration of those questions,” Judge O’Grady adds. 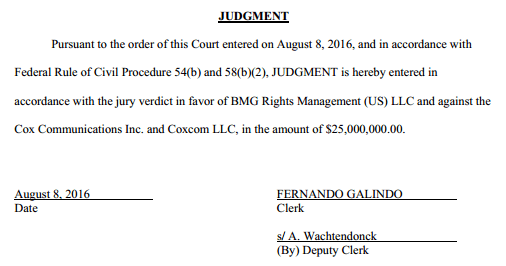 The above means that the $25 million judgment against Cox is upheld. While the ISP will be disappointed with this outcome, it will be pleased to see that BMG’s request for a permanent injunction was also denied. The music licensing group requested a permanent injunction against Cox, requiring the Internet provider to expose the personal details of pirating subscribers, and monitor their actions to limit or prevent further infringements. The court rules that the requested injunction is too vague. BMG failed to explain what actions the ISP would have to take, and Judge O’Grady notes that “limit” and “prevent” are two entirely different things. Among other things, BMG suggested that the ISP could ‘spy’ on its subscribers by using deep packet inspection, but it failed to provide more specifics. “Perhaps, as BMG suggests, Cox could require a subscriber to remove BitTorrent from their computers in order to remain on the network. Aside from the obvious point that this does not appear in the injunction, there was minimal testimony about deep packet inspection or its viability as a court-ordered solution here,” O’Grady writes. In addition, the court also rejects BMG’s request to receive email addresses, phone numbers and other personal details of repeat infringers, which would put the privacy of Cox subscribers at risk. In his decision to deny the permanent injunction, Judge O’Grady weighs in the fact that BMG waited for several years to take action. Both sides have yet to comment on the court’s ruling but considering the importance, it is likely that Cox will appeal the case to a higher court. A full copy of Judge O’Grady’s memorandum of opinion is available here (pdf).